As has been stated, the first white men to come here used canoes to come up the rivers. Flat boats and rafts were sometimes pressed into use. The Indians had trails along most streams and through the forests so it was quite natural that the explorers should use these foot or horseback trails. Without doubt, the first cow was led over trails from Bethel to Andover. Small bridges were soon laid over streams where much-used trails were. People found it cold and inconvenient to wade. Many log bridges, called corduroys, were easily laid for temporary use. Eventually good, firm, uncovered wooden bridges with stone abutments were constructed. 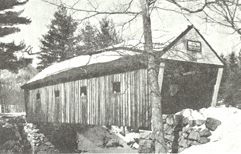 The Black Brook and Andover Falls bridges were necessary as soon as the road from Rumford Falls by way of Frye became the shortest way for the tote teams to bring supplies into town using huge sleds drawn by 2, 4, or 6 horses in winter and large carts or wagons, likewise horse-drawn, in the other months. North Andover still has small bridges over the various streams. Several of these were built surprisingly high, perhaps because at the time they were constructed and their stone abutments made, logs had to be floated down the streams early in the Spring. Before the time of trucks this was easier than hauling them by teams of horses. The East Andover bridge, near the Farrington Saw Mill, is over the East Branch of the Ellis River before it joins the West Branch at the famous "Meeting of the Waters." Sometimes some farmer misjudged the strength of the bridge with the result that suddenly one wagon wheel was through a gaping hole. This happened at the Andover Falls Bridge one day when a young girl was driving a horse out from Roxbury Meadows with a small hay rack full of hay.The scary accident happened to the Charles Lovejoy hay rack that was just ahead of her with a full load. Luckily, only one huge wheel went through and all the other farmers hastened to help. These old timers knew just how to address themselves to the problem and before too long the young miss drove over with fear and trembling. Andover is located in rather a wide basin of valley among the hills and mountains of western Maine. It is bisected by the Ellis River, so-named, it is said, from an Indian or half-breed trapper who had his camp and headquarters at the mouth of the river near Rumford Point. It is further divided by numerous brooks and streams that flow into the Ellis. When the first settlers came to Andover nearly 200 years ago, they came by canoe or spotted trail through the woods. Their first urgent need after clearing the land and building log cabins was a road passable to New Pennacook (Rumford) and Sudbury, Canada (Bethel) the nearest settlement on the south; as well as bridges to cross the streams. The first bridge--a log and plank structure--was carried away by freshets. 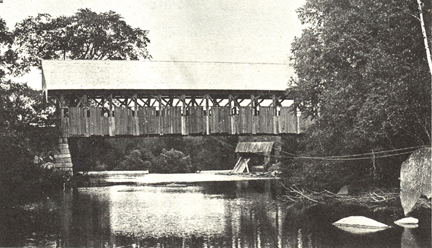 The first covered bridge was the Lovejoy Bridge, which derived its name from the Lovejoy house on the eastern side of the Ellis River. The bridge was constructed to replace a worn-out bridge in 1867 using the same abutments. The cost of the superstructure was $743.45, which was raised by taxation in the town. The Lovejoy Bridge was boarded up to the roof with three openings in each side for light and air. Wooden pins holding truss members in place were turned from a hackmatack. The ends of the bridge were painted white and display a sign: $3.00 fine for driving over this bridge faster than a walk. The Lovejoy Bridge is the shortest covered bridge in the State of Maine. Andover plans to keep this picturesque structure serviceable as long as possible. The high water of 1936 came within a few inches of the bottom of the bridge, while all of the road and fields were under water. Norman Hall and Robert Bailey were canoeing over the flooded area as the lowlands of the Ellis were all under water. Seeing that there was only a few inches between the level of the water and the bridge side, they thought it would be fun to paddle up beside the bridge, letting the bridge hold the canoe and the water rush underneath. The tremendous pressure instantly sucked the canoe under the bridge, throwing the boys into the water. Hall could swim and was lucky enough to be carried to one side of the channel. He swam to where he could grasp a tree to hold himself above water. The Bailey boy could not swim, but by a miracle he came to the surface in a group of bushes or small trees which he frantically grasped and held on to. Howard Dunning, an Andover guide who was canoeing over the flooded area, located them and got both ashore alive. The second bridge of this type was completed in 1870. It was called the Merrill Bridge from the Old Merrill Home at its eastern end. (We know it now as the Chandler House.) 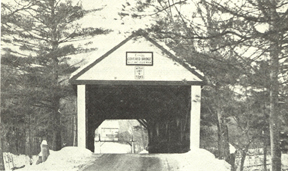 The old bridge had become unsafe and it was decided to replace it with a covered bridge of the Paddleford type-named after Mr. Paddleford who built covered bridges in New Hampshire. The cost of this bridge was $884.75. It stood until 1935 when it was torn down and replaced by a steel bridge with concrete roadway. The old stone abutments were retained but capped with concrete. The length of the bridge was 85 feet. The Brickett Bridge, the last of Andover's covered bridges, was built in 1871 over the West Branch of the Ellis River near Rand's Mill. It was boarded two-thirds of the way up, with one-third open at the top side. It was 90 feet long with split stone abutments built at a cost of $743.88. The superstructure was placed on them at a cost of $937.81. The total cost of this picturesque structure was $1,681.69. It was torn down in 1949 to make room for progress. Source: Andover: The First 175 Years, Prepared by the Andover Friday Club, Andover, ME (1979), pp. 153-156, Reprinted with permission of the current owner, The Andover Educational Fund, Inc.